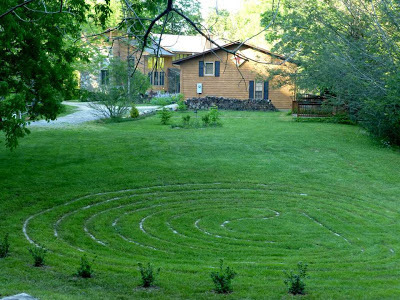 In 2009, we constructed a seven-circuit walking labyrinth on the southern end of the property at the Inn on Mill Creek, near black walnut, tall tulip poplar and maple trees. The Inn’s labyrinth is a classical style labyrinth based on one in Visby, Sweden – a shout out to Innkeeper Brigette’s dad’s Swedish heritage. It has a 2-ft. wide grass walking path bordered by white granite pavers. What is a walking labyrinth, you ask? It differs from a maze in that it has a singular path leading to the center and back out (although some labyrinth’s can have a separate singular shortcut path leading in or out to the center). You can find labyrinths in Greek and Roman mythology, on Roman mosaics and pottery, on the floors of medieval churches in Europe, and on the ground outside (commonly called turf mazes) in different countries, among other places. One of the most famous is the labyrinth at Chartres Cathedral in France. Many labyrinths, such as those in churches, were/are used for meditation, contemplation or prayer, symbolizing spiritual pilgrimage. Others were used for superstitious rituals, for example, prehistoric fisherman would use them to “trap” bad spirits before the fishermen headed out to sea. Labyrinths come in different sizes and patterns. If you want to locate labyrinths in your area, one place to look is the Worldwide Labyrinth Locator: http://labyrinthlocator.com/. Returning to our labyrinth…since we finished the walking labyrinth at the Inn, we have pondered and researched different landscaping options for it. We want a nice shrub border around the outer curve, evergreen, and not too showy. We also plan to relocate the blueberry bushes nearby to a a more sunny spot (the trees have grown up around them and now they’re too shaded), so we have landscaping plans for the general area around the labyrinth as well, but have not wanted to do too much yet until the blueberry bushes are relocated.